I have so many memories of these islands, some of them bleak and even painful, but many of them rich and happy. I choose to offer you a small taste of the latter. The first day I arrived on the islands, I went to a little Chinese food “bowling alley café” and met a young man, who insisted on taking me for a local tour of his island. That day I had a lot of interesting experiences. 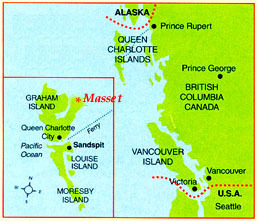 But one that really stuck with me** was walking along the beach at the north-eastern tip of Masset Inlet. It was so much wilder and more beautiful than the urban beaches around Vancouver. The rocky shoreline was flecked with white, the remains of endless generations of clam shells piled up by long-ago inhabitants of the islands. Lower on the beach were little pebbles which, among the myriads of other pebbles, glinted brightly, picking up and reflecting the sunlight that shone through the misty splashes from waves that had traveled perhaps thousands of miles across the great Pacific Ocean, drawn by the Japanese current which ends its long journey by wrapping around the northern tip of Haida Gwaii. Lionel picked several up and gave them to me, and I slipped them in my pocket. I had seen agates before; in fact, my parents had a bucket of them that they had picked up many years earlier on those same beaches, and we had used them year after year in our Christmas tree stand! But it was such a totally different experience to see them in their natural environment. Lionel told me about the really rare black agates, and promised me that one day he would find one for me. Also along the shoreline tossed helter-skelter were great bleached-white logs and tree roots and bits of branches, and multi-colored plastic fish floats here and there, and shells of many kinds, most broken but some managing to proudly hold together despite the power of the waves crashing onto the shore. Lionel told me how when he was a child, it was also easy to find Japanese glass fishing float balls, and though I had seen them before in my parents’ collection, I longed to find one myself. And a few years later, I did. What a miracle that it had survived years of a long oceanic journey and had come to rest, amazingly unharmed, on top of the pale skeleton of a mighty tree! He also told me of the tiny glass beads that early European sailors had traded to the Haida for rich otter-skins and other furs. He told me that perhaps some day I might find one among the pebbles of the beach. And indeed, years later, so I did! But the beaches are not the only beauty of these rugged islands. This is a land of rain, especially in the more southern islands, and home to great temperate rainforests, in which cedar and hemlock and other species of trees grow to immense sizes. It was the ancient cedars which the Haida people used to build their great longhouses, and their mighty canoes in which they traveled as far south as California and as far west as Hawaii. While it is so sad that many of the great ancient forests have been clear-cut in greed and lack of understanding of the value of these old-growth forests, there are still places where you can wander among the great overhanging branches of trees that stretch far, far upwards, meeting in a great canopy which filters the sunlight, and leaves the forest floor often barren but for a soft bed of fallen needles and the remains of great giants of the forest that have fallen in old age, and become nurseries for their grandchildren. From the lower branches of the trees hang great beards of moss. Breaking out of the forest, one comes upon open meadows that are really bogs of great beauty, the surface scattered with little pools of water reflecting the sunlight, and, in season, acres of bog cranberries ripe for the picking. Taking another direction, one comes out of the forest onto great wide sandy beaches, which above the tide line with its beached logs and other detritus, are vast grassy fields, with small trees scattered here and there, standing determined despite the shifting sandy soil, and the winds and mist whipping off the ocean. And in season, those fields are covered with countless wild strawberries, rich and sweet, a true treasure of little gems. Even on the scarred hillsides where the great trees have been felled, and nothing left behind but drying skeletons of tree species that have been cut and abandoned because they did not fulfill the economic goals of logging companies, nature has created great beauty, and great natural riches, as the rich forest floors have nurtured countless bushes of red and blue huckleberries, and salmonberries, and thimbleberries, and more. There is no need to go to the store for fruit, for with just a little effort one can easily pick and store up for winter enough berries to enjoy them everyday for the next year! And so also can one live off the other bounties of the land – the deer who have been introduced and have thrived on the rich grasses of the cleared land, and nutritious roots and natural medicines from the bogs, and from the seashore, endless bounty, clams, devil-fish, salmon, halibut, and so much more. It is no wonder that the Haida people chose to stop here and settle, and that over the years, in this richly endowed environment, they developed a complex culture and art that is admired all over the world. There was a time, after the Europeans came, that the people of these islands were put down, their numbers decimated by smallpox, their children sent away to residential schools, their amazing fishing boats confiscated by the government, and many more tragedies of history. But the Haida people are a proud people, and their spark has never gone out. Today their numbers are growing again, and they are becoming strong again, becoming the Watchmen of these beautiful islands, which the white man named Queen Charlotte Islands after a queen of a country half a world away, but which today are being recognized far more often by the name given by their people, Haida Gwaii, Islands of the People.